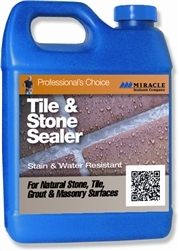 Miracle Sealants Tile & Stone Sealer is an enrty-level low cost alternative to impregnating/penetrating sealers. Tile & Stone Sealer penetrates into the pores of the surface to form a barrier that is resistant to moisture and stains while allowing complete vapor transmission. 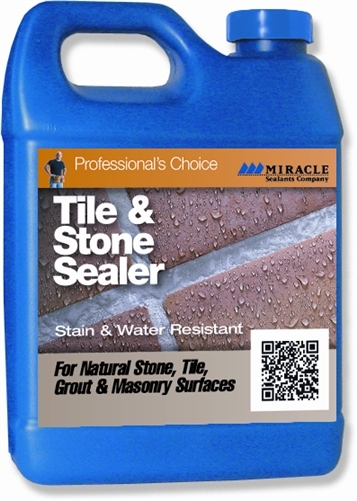 Miracle Sealants Tile & Stone Sealer is not a surface coating and will not alter the natural look. All surfaces treated are harder and less slippery. It can be used on both interior and exterior applications. Used as directed, Miracle Sealants Tile & Stone Sealer will cover approximately 125 - 1,000 square feet per quart.